Ok lovebugs, it's been a long week and it's time for some comfy class. I'm talking about velvet. I love velvet in December because it's dressy or casual. This fabric is perfect for winter and especially the holiday season. 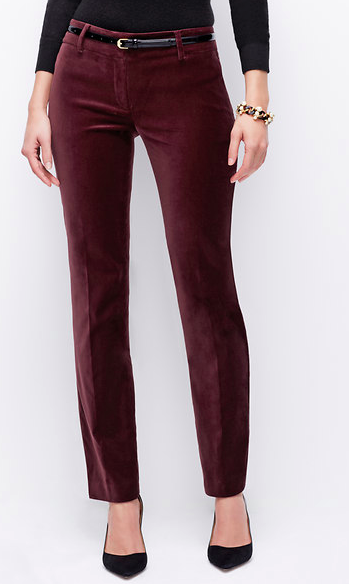 Let's look at some great velvet pant options. I love Loft pants. You can throw them in the wash, you can wear them to work, you can wear them for play. They work for everything and they hold up for years. A great jogger option, this pant features a drawstring and a fitted ankle. The price is high, but these will be your go to pant in the winter. This chianti hue goes with green, navy, tan, you name it. How about a navy option? I love the ankle crop because you can show off some sassy heels. Try out some velvet this winter. It isn't as loud as plaid but it's perfect for the season.